Sergio was recommended to my by a friend who grew up in Cozumel and his recommendation was dead on. Sergio is very professional and extremely friendly. 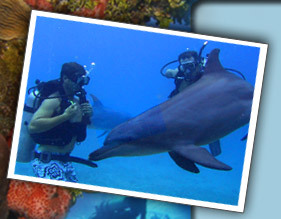 His bright smile puts everyone at ease and assures all will have a great adventure diving below the electric blue waters of Cozumel. A group from Houston, Texas informed me they use Sergio each time the come to Cozumel and they feel extremely blessed to have found this excellent diving guide. Unlike other companies that tend to rush through the dives on small speed boats and quick surface times, with Sergio you'll enjoy a long ride on the Swordfish a large boat that makes sea travel fun, not choppy. He and his crew took great care of us and provided fresh fish ceviche, guacamole, pico de gallo, sandwhiches, drinks and more for lunch between dives. At Santa Rosa we spotted two nurse sharks and large lobster along with multitudes of tropical fish and rainbow colored coral. We also had various swim throughs... just beautiful! Thank you for an enjoyable two days of diving early February. The tortas were good and the crew pleasant. The water as usual was remarkably clear and warm. I did not want to leave Cozumel. Great Dive Trip as always...second time with Sergio and Paul and the dive was outstanding! Hi Sergio. Flip and I had such a great time diving with you last year we decided to come back to Cozumel this year instead of exploring new places. Something we have never done in over 15 years of diving. Your boat, your hospitality, Jesus's food, and your dive master ability can't be beaten. We hope you have space for us for six days starting on Feb. 28. Thanks for 3 great days of diving! I really enjoyed myself. The Swordfish is a first rate boat to dive from-- very comfortable, spacious, and (best of all) I didn't get seasick despite the high seas. Jesus took great care of us and provided an amazing lunch every day. And, of course, thanks to you, Sergio Sr., and Ugo for great dive mastering. Gracias queridos Sergio papá e hijo por esta increíble experiencia. Definitivamente después de bucear Cozumel, el resto parece más simple!!! Esperamos regresar pronto. Guys, thanks for a wonderfull dive & snorkle trip. 2 of my finest dives ever and Ada realy enjoyed the snorkling. Next time Mexico we'll come by again.